The operator of Platinum Fashion Mall in Bangkok, the Platinum Group, is branching out to Koh Samui as part of their sustainable growth plans. Somboon Wongrssamee, the President of the organization said that that company is spending 300 million baht on the development that covers a ten rai plot and will be known as the Wharf. Further plans are afoot to develop two hotels worth 600 million baht next to the Wharf that is located in Bophut and will sign a memorandum of understanding with a hotel chain to manage the hotels. “We are interested to expand our business into Koh Samui because we see growth potential for both foreign and local tourists. 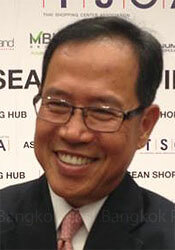 The market opportunity is better than Phuket and Hua Hin, which are quite crowded,”Mr Somboon said. The project is important for the company because Samui is a world famous beach destination. It is hoped that the expansion will help boost Samui’s growing economy and harness the purchasing power of visitors from Australia, Russia and China. The mall can accommodate 135 tenants and the group expects its community mall to be another place for customers to hang around and enjoy a wide range of products and services that will respond to their needs. Will Samui Paradise turn into garbage heap?